A couple of my photos are featured on the Schmaps digital travel guide website. The editors must go through Flickr, find and select photos they want to include, email the owner for permission and once they receive permission, use them on their site. I haven’t kept the initial email so this could be incorrect. Apart from having my photos included (the one here is circled in red), and linked to my Flickr page, I don’t receive any money or any other kickbacks. To be honest, that is fine because my photos are available for all to see on Flickr anyway and anybody can steal or use them without asking (not that I want them to). 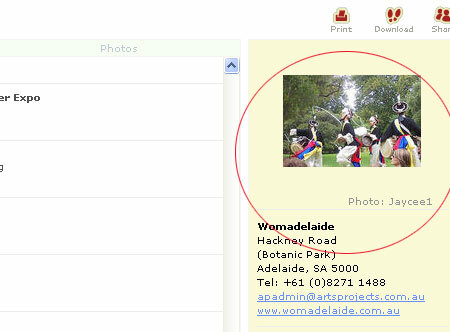 The views of these photos hasn’t risen highly or anything, but because they’re of Womadelaide it will be interesting to see what happens around Womadelaide time next year. There is some debate around the web about Schmap’s use of people’s photos which I found after I’d said yes, but I still stand by my decision. Well at least that’s pretty cool that they picked yours–rather flattering really. They have used mine as well – only after asking permission. I am happy to give my photos to web publication, I have CC licensed all of them. They used one of mine – with permission – although when I got the original Flickr-mail I wondered if it was a real-deal or a scam.